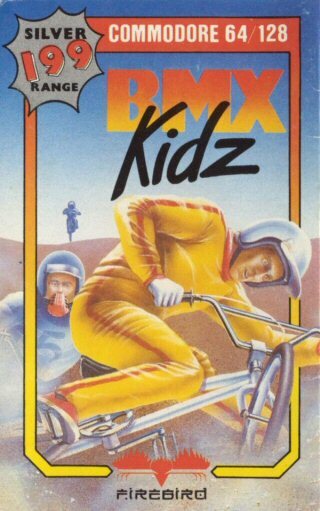 To start again: SYS 24586 BMX Kidz - For your delight and delectation. Superbly written by Jo 'Gi-Jo' Bonar with assistance from Dave 'Ubik' Korn for Gigglyworx (C) 1987 And why not? Designed by Col 'Rad-Boy' Fuidge and Aunty Milton (& Captain Creative). Dazzlingly well produced by Firebird Software. Digitally dextrous amazing music (and sound effects) by Rob Hubbard. Almost entirely unbelievable graphix by Paul Docherty. Layouts by Aunty Milton. Seriously deranged Hi-Score musix by Jori Olkkonen. Pixelly perfect loading screen by Bob Stevensson. Press fire on either joystick to start the game (cheatmode inactive) Repetition teaches the donkey. Everything comes to him who waits. Extra Bonus: Type "LSD" to view endsequence! Type "Vivaldi and then any key from [A] to [F] for starting level! Yo! BMX Kid! You've got 02:10:00 to complete track 01, Practice stunts and wheelies!! Go!! Go!! Go!! Yo! BMX Kid! You've got 02:10:00 to complete track 02, Do 1 wheelie & 1 Stunt. Go!! Go!! Go!! Yo! BMX Kid! You've got 01:50:00 to complete track 03, Do 2 Wheelies & 1 Stunt. Go!! Go!! Go!! Yo! BMX Kid! You've got 01:40:00 to complete track 04, Do 2 Wheelies & 2 Stunts. Go!! Go!! Go!! Yo! BMX Kid! You've got 01:30:00 to complete track 05, Do 3 Wheelies & 2 Stunts. Go!! Go!! Go!! Yo! BMX Kid! You've got 01:20:00 to complete track 06, Do 3 Wheelies & 3 Stunts. Go!! Go!! Go! !